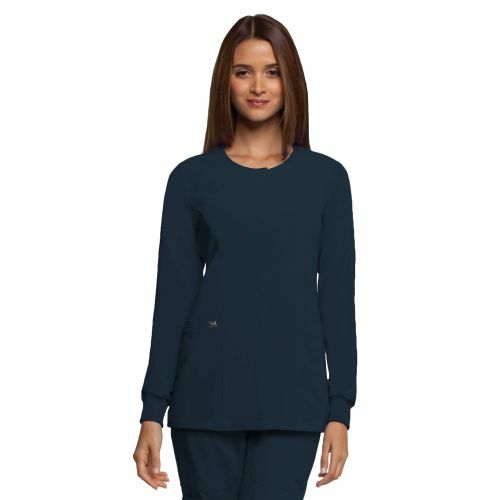 Features round neck, snap front, rib knit cuffs, and princess seams. For storage, 2 deep front pockets. In the back, fitted darts and half-band detail. Banded side detail with logo embroidery on the left side and a logo tag on the right pocket. The Grey's Anatomy Signature 2407 warm-up scrub jacket features a rounded neck, seven snap buttons, rib knit cuffs, and princess seams in the front. For storage, two deep front pockets. In the back, there are fitted darts and half-band detail. Banded side detail, with logo embroidery on the left side and a logo tag on the right pocket. A one-inch hem. Grey's Anatomy arcLux™ 4-way stretch fabric is 71/24/5 poly/rayon/spandex.